This article focuses on the lives, craft, and relationships of the Courtaulds, a family of Huguenot silversmiths that lived and worked in England in the 18th century. It originally appeared in the March 1947 issue of American Collector magazine, a publication which ran from 1933-1948 and served antique collectors and dealers. Names may be merely a group of letters and as such have but little meaning. If for the sake of entertainment we turned the pages of any large directory we might discover that certain names left some of us cold while touching in others a warm glow. 1. Pear-shaped caster with handsomely pierced cover by Augustine Courtauld. Date 1726-27. Patriots, for example, would be touched by names recalling men associated with the history of a country, while we collectors would be touched by names recalling the artists and fine old craftsmen whose work we seek so eagerly today. Among silver collectors, a particular glow occurs at mention of the names of early goldsmiths (or silversmiths as we now refer to them). Fortunately we have more or less complete records of their names and history. In some cases the modern form may vary considerably from the original but there is usually no difficulty in recognizing them. For instance, although the names of many of the Huguenot craftsmen have been anglicized, the change in most cases is only phonetic. Thus in Geslin, we might look for the original Ghiselin, the Huguenot silversmith who came to Philadelphia from England and worked for William Penn. Again, the modern Longmoor may well be the anglicized form of Longuemare, a South Carolina Huguenot. Others, such as Grignon, Legare and Quintard have remained unchanged. Today the names of many of these Huguenot refugees from religious oppression are prominent in the world of finance and commerce, as for example that of Courtauld; the present members of this well-known firm being direct descendants of the celebrated goldsmith, Augustine Courtauld, who with later members of the family contributed so greatly to English 18th-century silverwork. 2. Superb example of Augustine Courtauld's achievement of fine form by beautiful proportions and bold, clear outline. 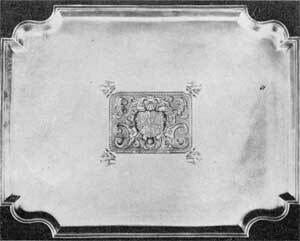 A tray dating 1721-24. Width, 211/2 in. Weight, 125 ounces. Sold in 1945 for $6,800. In addition to Augustine Courtauld, who is to be regarded as the founder of the family in England, there are four others of his name connected with silver craft who registered marks at Goldsmiths’ Hall in the 18th century: Peter, half-brother to Augustine; Samuel, son of Augustine; Louisa Perina, widow of Samuel; and Samuel the younger, son of Samuel and Louisa. It would seem probable that Augustine, Sr., was born at St. Pierre in the Ile d’Oleron about 1686 and was brought to England when his father fled from France in 1688. In Silver Wrought by the Courtauld Family, Samuel Courtauld says of the infant Augustine’s arrival that it is traditionally thought he was “concealed in a basket of vegetables.” His half-brother, Peter, was born in the parish of St. Anne, Soho, London, some few years later. In time, both boys were apprenticed to the goldsmith, Simon Pantin, which fact might give us to think that their father also was a goldsmith. Any such supposition, however, is not supported by the two identures. In the apprenticeship of young Augustine, dated 1701, the father is described as a wine cooper, which would infer he was a maker of wine casks, while Pantin’s name is spelled in its French form, Pontaine. In the record of Peter’s apprenticeship the father is described as a vintner (wine merchant) and Pantin’s name appears in its anglicized form. Having served the usual term of seven years under Pantin, young Augustine Courtauld started out on his own and entered his first mark at Goldsmiths’ Hall in 1708. This, the first of four marks, was the first two letters of his surname — CO — with a fleur-de-lis above. It might be well to mention that an appreciable number of early 18th century marks are the letters CO or Co, silversmiths at that time having to use the first two letters of the surname. 3. Simplicity of form and outline, accented by subdued, delicate decoration (as in these tea caddies) characterize the silverwork of Augustine Courtauld. The pair, left and right, dated 1726-27; center casket, 1731-32. All three engraved with the arms and crest of the Still family. But as each of the punches is accompanied by some device and the shapes of the punches themselves vary, they are easily distinguishable. In the same year, 1708, Augustine Courtauld entered another mark, his initials in small gothic letters, ac. It is this punch which is found on the miniature pieces, known as toy silver, of which he produced an appreciable amount. His third mark, entered in 1720, was his initials AC with a fleur-de-lis above. An historical piece bearing this mark is the state salt-cellar of the City of London Corporation. This salt may be described as an example of Courtauld’s rare venture into the field of fantasy. It has a large bowl ornamented with embossed and applied strapwork on four somewhat massive supports in the form of dolphins, the heads of which rest on shell-shaped feet. 4. Another example of the way Augustine Courtauld gained distinguished simplicity by leaving much of his silver surface plain. 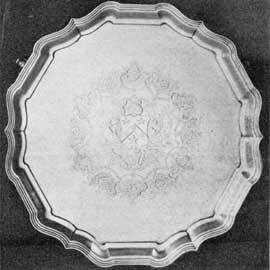 Vigorously shaped salver dating from 1730-31. Engraved with the arms of Blackett. Around the rim of the bowl are four scroll brackets with female-head terminals, the brackets being intended to support a napkin or other cover when the salt was not in use. Hall-marked 1730-1, this important if not too beautiful example of his work is 10 inches high and 5 inches diameter at the rim of the bowl. Augustine Courtauld’s last mark, AC in script capitals with a fleur-de-lis below, was registered in 1739. Because the forementioned state salt displays a decided leaning toward the fantastic it is not representative of Augustine Courtauld’s work at any period of his career. In general, his work indicates that he preferred to produce the more modified designs and ornamentation of the rococo style as illustrated in fig. 1, a caster of which the only decoration — apart from the engraved arms — is a small band of rococo motifs on the shoulder. This simplicity of outline and avoidance of unnecessary ornamentation is characteristic of all the silver-work bearing his mark. Where decoration is used it is restricted to finely chased forms, delicate engraving, applied strapwork and flutings. An excellent example of his engraved work is shown in the three caddies in fig. 3. The smaller two of these bear the hall-marks for 1726-7, the other having been made by Augustine five years later, its hall-marks being 1731-2. In addition to the finely engraved bands round the panels and the lids, each of these caddies is engraved with the arms of Still of County Dorset, England. 5. Miniature or toy silver pieces copied by Augustine Courtauld from full-sized models. He made numerous such miniatures. Note the old-style, lantern-shaped teapot (upper right) that harks back to the 17th century. One very notable example of Augustine Courtauld’s reliance upon outline for beauty is shown in the large tray in fig. 2 which is devoid of any decoration other than the finely executed arms of Thomas Malin who married Mary Carbonell at St. Botolphs, Bishopgate, London, in 1722. In view of the fact that this tray bears the hall-marks for 1721-2, we may assume it was specially made as a wedding gift. It is some 22 inches wide, weighs no less than 125 ounces and was formerly in the collection of the late Thomas Hugh Cobb. When this collection was sold at Sotheby’s in 1945 the tray met with remarkable competition from the buyers, eventually bringing $6,800. The salver in fig. 4, also by Augustine Courtauld, is another instance of a large surface being left plain except for the engraved arms, which are those of the Blackett family of Northumberland. One often overlooked branch of the 18th century silversmith’s craft is the making of silver toys. These attractive miniature pieces were produced in many shops as is evident from the number of men described as “goldsmith and toyman” in the lists compiled by Sir Ambrose Heal. And though Augustine Courtauld does not seem to have added “toyman” to his “goldsmith,” he was nonetheless one of the foremost makers of these tiny pieces of which a number are illustrated here (fig. 5). Among his toys it is not uncommon to find pieces copied from styles antedating his time, showing he used models of earlier periods. An example of this copying from the “antique” appears among those illustrated, namely, the curious tapering pot with a long tubular spout and conical lid — obviously a copy from the early lantern-shaped tea-pot, one of which, made in 1670, is now in the Victoria and Albert Museum. 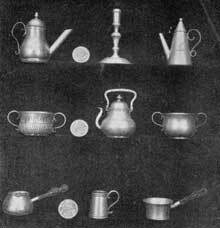 He also made miniature tankards of the type fashionable in the time of Charles II; tiny pillar candlesticks with octagonal bases copied from the columnar sticks of the later 17th century; and this writer has seen a miniature silver fireplace that he made. Several lads were apprenticed to him and at least two appear later in the records of London goldsmiths. One, Isaac Ribouleau, the son of Huguenot parents, began his apprenticeship in 1716, eight years later entering his mark and opening a shop in London in Lombard Street, at that time one of the centers of the craft. Another, Louis Ouvry, apprenticed to Courtauld in 1730, entered his mark at the Hall nine years later. Sir Ambrose Heal lists the name “Ouvry (or Ourry) Lewis, plate worker, Golden Crown, New Street, Covent Garden, 1740-42,” which we may assume refers to Courtauld’s apprentice. Also there is a record of a mark LO in script with a crown above; it was found on a plain mug, hallmarked 1740-1. 6. Pyriform tea kettle and stand with subdued rococo decorations of flowers and scrolls. By Samuel Courtauld, Sr. Dating 1755-56. Very little is known of the half-brother, Peter Courtauld. After finishing his time with Simon Pantin in 1712 he apparently became a freeman of the Goldsmiths’ Company but does not seem to have entered a mark until 1721. In that year he entered two marks: one, the first two letters of his surname, CO with a crown above; and the other, his initials, PC with a crown above. At this time he opened a shop in Litchfield Street, Soho, London, but died eight years later and no work bearing his mark has been recorded so far. Augustine Courtauld’s son, Samuel, was apprenticed to his father in 1734, at the age of 14. On completing his apprenticeship he presumably continued to work in his father’s shop in Chandos Street until his father’s death in 1751, when he moved to 21 Cornhill. Silverwork made by this Samuel (the elder) is mostly marked with his initials SC with a pellet between and a rising sun above, but he did use another mark — his initials and the pellet but without the rising sun; the latter, however, is rare. He issued two trade cards, the first of which describes him as. “Goldsmith and Jeweller at the Rising Sun Shandos Street, St. Martin’s Lane, London” and a more elaborate card after he moved to Corn-hill, giving his address as “At the Crown in Cornhill Facing the Royal Exchange, London.” Much of his work shows the influence derived from his father in the simplicity of its design and in the splendid workmanship but while the latter is characteristic of all the pieces bearing the mark of Samuel the elder, he later developed a tendency toward more exuberant rococo forms of ornamentation. This later tendency became increasingly apparent as his years advanced. The pyriform kettle and stand of 1755-6 (fig. 6) shows subdued rococo forms in the finely chased flowers and scrolls on the shoulder of the kettle and in other motifs but another two-handled cup of five years later already displays all the exuberance the rococo style developed in England, an exuberance which became so popular that it was adopted by most of the London craftsmen with the result that many a fine design was lost beneath a mass of scrolls, shells, floral swags and other ornamental forms. 7. 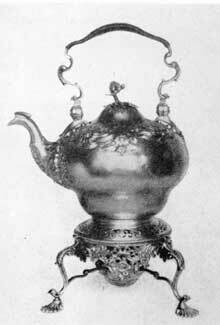 Repousse silver hot water urn in the neo-classical style. Bearing the marks of Louisa Courtauld and George Cowles, 1776. In 1749 Samuel Courtauld married the beautiful Louisa Perina Onger whose portrait was painted by Zoffany. She became the connecting link with the third generation of Courtald goldsmiths as represented by the son, Samuel the younger. This lad was only 12 years old when his father died in 1765 and Louisa undertook to carry on the shop in Cornhill alone, entering her own mark at Goldsmiths’ Hall, her mark being LC in a lozenge-shaped punch. But while a number of examples bearing her mark are known in various collections it is rare, indeed, that one makes its appearance on the market. After carrying on the business for slightly more than three years, Louisa apparently decided that running a fashionable silver shop alone was too great a responsibility. In 1769 she took in as a partner an experienced craftsman named George Cowles. It was during the Courtauld-Cowles period that the rococo style finally gave way to the so-called neo-classic style introduced by Robert Adam. Consequently, examples bearing the mark of the partnership, LC GC, reflect the change observable in both form and ornament of all design after about 1765 — a change well illustrated in the fine urn illustrated in fig. 7, which bears the London hall-marks for 1776-7. In the following year, 1777, the partnership was dissolved, doubtless because Louisa’s son, Samuel the younger, had joined his mother in running the shop. There would seem to be some doubt as to whether Samuel the younger served an apprenticeship or for that matter whether he was ever apprenticed. And though the combined mark of Louisa and her son Samuel was entered, the indications are that at no time did he show any great inclination to follow the goldsmith’s craft. 8. Adam style two-handled cup by Louisa Courtauld and her son, Samuel, Jr., 1778-79. In view of the short time that Louisa and her son were in business together it is not to be expected that examples bearing their combined mark could be plentiful. Yet such as are known suggest clearly that some important silver work was produced in their shop, and for a fashionable clientele. 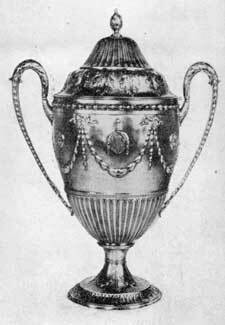 This is evident from the elaborate two-handled cup (fig. 8) which is typical of the formal style of the late Georgian period — the classic influence showing itself in the festoons of laurel, the guilloche band, flutings, acanthus leaves and other forms that Robert Adam had borrowed from ancient architecture and adapted to his own designs of architecture, interiors and furnishings. Actually, Samuel the younger remained in business with his mother for a bare three years only. He then emigrated to the United States where he is believed to have become a merchant. The records show that he died at Wilmington, Delaware, in 1821, aged 69. After he left England, Louisa Courtauld sold the business in Cornhill to John Henderson. Thus after nearly a century the name of the Courtaulds disappeared from the list of active goldsmiths. Their fame, however, has never disappeared. It is still increasing. “ ” I was this incredibly tiny, gray-haired gnome.